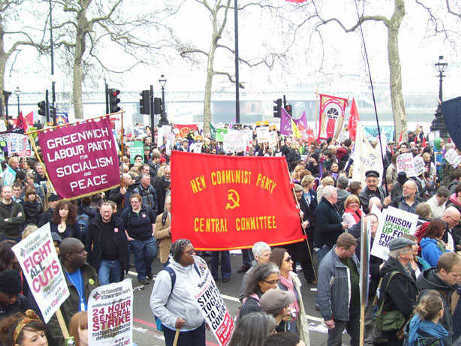 NEW COMMUNIST Party comrades from all over the country descended on London to join more than half a million demonstrators last Saturday to take part in the TUC’s March for the Alternative to the massive cuts in public jobs and services being implemented by the Con-Dem Coalition. The protesters came from every trade union you can name and from every city, town, hamlet and village in the country. They came by coach, train, bus, bicycle, wheelchair and on foot. And there were solidarity contingents from Europe. The march through the heart of the capital was so big that five hours after the head reached Hyde Park marchers were still thronging past the giant statue of Achilles, festooned with banners, placards, balloons and ribbons. The marchers could be heard coming from far away — armed with whistles, vuvuzelas, brass bands, jazz bands, songs, chants and slogans. At the rally in Hyde Park there was a long list of speakers from the galaxy of the union movement including Len McCluskey of Unite, Michael Leahy of Community, Brendan Barber of the TUC, Dave Prentis of Unison, Bob Crow of RMT, Mark Serwotka of PCS, pensioners, leaders of Black and minority ethnic organisations, representatives of European trade unions, students, disabled workers and people from the world of show business — all introduced by TV presenter and comedian Tony Robinson. In his speech Len McCluskey repeated his call for the Met police to “keep your sleazy hands off our kids”. He called on Labour MPs to come to “the barricades” and saying that the country needed “coordinated industrial strike action” and more “direct action”. Few Labour parliamentarians would go that far these days. But some were part of the vast crowd in Hyde Park which heard Labour leader Ed Miliband declare that he was “profoundly moved” by the turnout. “David Cameron, you wanted to create the big society. This is the big society,” he declared. Miliband was the first Labour leader to attend a demonstration of any kind since Michael Foot back in the early 80s. In the past most of the people filling Hyde Park were workers of the kind that the bourgeoisie called the “the salt of the earth”. Yet Miliband was attacked in the bourgeois press and media for associating with them. The lines for a serious class war are being drawn — by the ruling class. In his speech PCS general secretary Mark Serwotka restated his union’s opposition to all cuts and called for joint strike action. He began: “What a fantastic turnout. Now, let me start with a story. Before Christmas, I went with the leaders of the TUC to meet the Government. Do you want to know something amazing about the Government — everyone on their side of the table was a multi-millionaire. “And these multi-millionaires, they tell us we’re all in it together. But they don’t use our services and they don’t use all the things we care about in our community. “Now listen. Let’s be clear about this demonstration and something my union feels passionately about. And let the journalists and the media hear it loud and proud. We must oppose every single cut in public spending. No cuts. No Cuts whatsoever. “And why do we oppose every cut? Because if we don’t we will have to choose between young people and pensioners; between public sector and private sector; between those on welfare and those in work. We should defend every student, every pensioner and every worker wherever they are. “So, let’s also be clear about two things to finish. There is an alternative to the cuts, and I’ll tell you what the alternative is. “Now look around you in this park. Imagine what it would be if we didn’t only march together, we took strike action together across all of our public services.